Do you have 12 hours to spare and the inability to pick a nail polish colour? #PolishMountain may be the trend for you. #PolishMountain was a trend started by YouTuber Christine Rotenberg after she was challenged to use every nail polish colour she owned. It resulted with her painting 116 coats of nail polish, creating a polish mountain. It has sparked a lot of people wanting to experiment with the trend themselves. Between each coat, the nail polish has to completely dry otherwise the final result ends up looking something slightly less than appealing. The photo below is Christine’s first attempt at the challenge, having applied 40 coats before giving up and restarting. The trend has taken off, with the original video having over 15 million views at the time of writing! Popular YouTuber Jenna Marbles decided to take this trend a step further, uploading a video of her doing 100 coats of nail polish, false eyelashes (50 per eye), foundation, liquid lipstick, spray tan and hairspray. After 4 days online, her video has reached over 5 million views, and has trended worldwide on social media platforms. So what do you think? Is this trend a waste of time or a new fashion statement? Would you ever try it? It’s that time of year again, where all the attendees of music festivals break out their flower crowns and head out to Coachella, Osheaga, Lollapalooza, Blues Fest and the like. If you’re in need of some style inspiration for this year, look no further – we’ve got you covered. Let’s switch it up this year and ditch those flower crowns. Braids and buns are great for creating unique and gorgeous hairstyles. They are especially cute when combined. Make your eyes sparkle with glitter, polka-dots and gemstones. Combine the glitter and bun trends by applying glitter to your roots! Mix in glitter with hair gel to make it stick. We are absolutely loving unicorn nails! Feeling a little intimidated by these styles? No worries – book an appointment at Hair Republic Beauty Lounge for Hair, Makeup, Nails or all three and we’ll get you festival ready. Eyelashes extensions give you the perfect looking lashes everyday. No need to struggle with mascara and clumping, they are ready as soon as you wake up! Just like the hair on our scalp, our eyelash hair goes through cycles. Understanding these cycles can help you understand when is the best time to get your extensions, how often to get them refilled, and why your eyelashes (both extensions and natural) may be falling out. Eyelashes grow in three stages: anagen, catagen and telogen. Simply put, the anagen phase lasts 30-45 days and it is when eyelashes are still new and delicate. 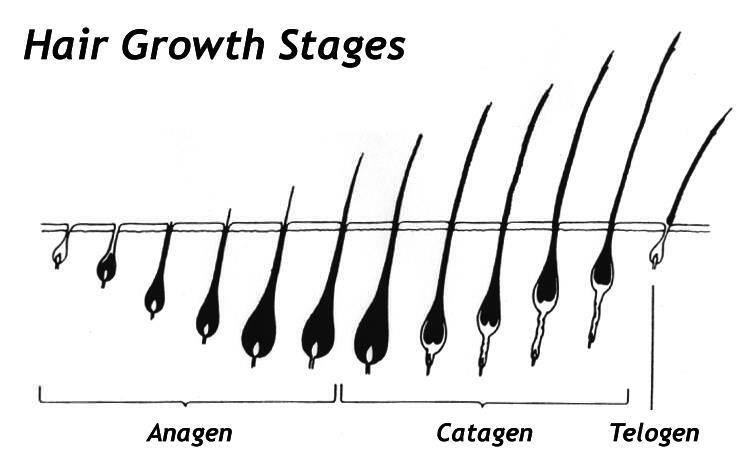 The catagen phase is when lashes are at their strongest, and is around 2-3 weeks long. During this phase the lash stops growing. Telogen is the final stage and it’s when lashes begin to fall out, and make room for new lashes. Every hair in your eyelashes is on it’s own cycle, so they won’t fall out all at once. When you get eyelash extensions, they tend to follow a similar cycle. Eyelashes are applied to lashes in the catagen stage because they are strong enough to hold the extensions. From there, the extensions will follow the natural hair cycle, falling out when the lash is in the telogen stage. Because lashes tend to stay in the catagen phase for 2-3 weeks before they begin to fall out, we recommend coming to get lash extensions filled, or touched up, in that same time frame. This allows lashes that have recently entered the catagen stage to be extended, to make up for gaps where lashes have fallen out. To maximize your lash life, you should take makeup off every night (preventing breakage and drying out), eat well (to maximize the nutrients involved in hair growth) and choose only the best products to put on your face and lashes! Winter is in full swing here in Ottawa, which means everyone is bundling up to stay warm. Unfortunately with cute knitted headbands and patterned scarves comes static and frizzy hair. We have 6 tips to help you prevent and repair the effects of hat hair! Wool causes friction against the hair creating damage and frizz. Look for hats that have a silk or satin lining to protect your hair from rubbing up against the harsh wool. Use a hair brush that has natural bristles, such as boar bristles. These brushes are similar to human hair so they cause less stress and less damage. As a bonus, natural bristles will also help add shine to your hair! Spraying a little bit of static guard on your hands and rubbing it through the mid shafts and ends of your hair will help reduce any static caused by hats or scarves! Running these sheets over your hair will eliminate the static. Carry some in your bag and slip off to the restroom when you arrive at your destination. Carrying a travel sized hairspray in your bag will save you from many hair disasters. Spray a little bit in your hands and lightly smooth out the fly aways caused by your outerwear. As a last resort, hand cream is an excellent smoothing cream. Rub a pea sized amount of cream in your palms and smooth it over your hair, but avoid the roots. Applying hand cream directly to your roots will cause them to look greasy.